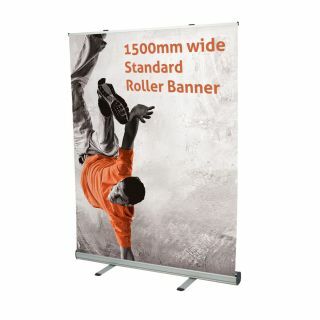 A Wider roller banner in a standard convenient roller banner base with twisted feet. Large size rollers are ideal for quick product displays of substantial size, and great budget solutions for exhibition spaces. Available in sizes up to 2000mm. With a weighted base in a smart aluminium finish, the cassette features twin twist-out feet for excellent stability, a strong bungee pole and a snap clip top rail, for ease of use and easily replaceable graphics. Also available with a premium deluxe style base for a more professional style look.